NEW YORK (WABC) -- Here is the info for the ceremony to be held at ground zero on Tuesday, September 11, 2018, to mark the 17th anniversary of the 9/11 terror attacks. The National September 11 Memorial and Museum will observe the anniversary by remembering and honoring the 2,983 men, women and children killed in the attacks at the World Trade Center site, the Pentagon, aboard Flight 93, and those who died in the February 26, 1993 World Trade Center bombing. The ceremony will take place on the 9/11 Memorial plaza at the World Trade Center site in Lower Manhattan. The commemoration is for family members of victims of the 2001 and 1993 attacks, and they have been invited to participate in this year's reading of the names. The 9/11 Memorial Museum will be open solely for family members. 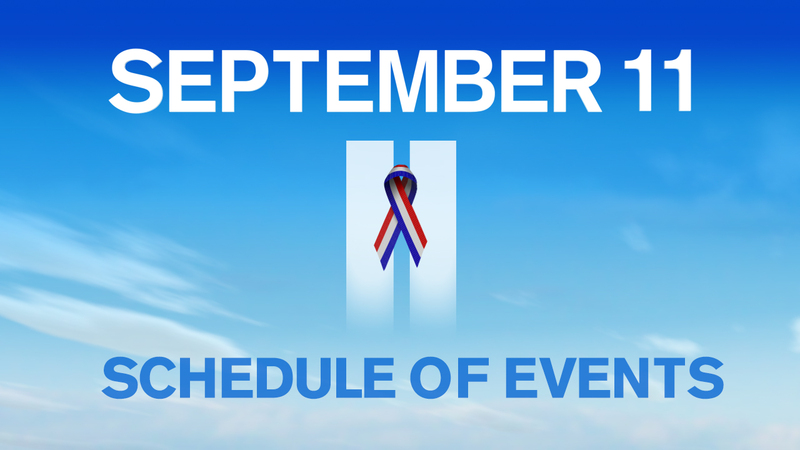 The ceremony will pause at six moments - twice to mark the times that each plane hit the towers, twice to mark the time when each tower fell and to mark the moments of the attacks on the Pentagon and on Flight 93. The first moment of silence will be at 8:46 a.m., and houses of worship have been asked to toll their bells at that time. The ceremony will conclude at approximately 12:30 p.m. (this is subject to change). -Families of victims of 2001 and 1993 attacks will begin reading the names. 9/11 Memorial Names: A complete list of the names of the 2,983 victims can be found at 911memorial.org/names-memorial. Explore the names arrangement and learn more about each victim using the Memorial Guide. An honor guard made up of individuals representing the FDNY, NYPD and Port Authority Police will participate in the ceremony. The Tribute in Light will return for one night as a tribute to all those who were killed on 9/11. The lights are located at West and Morris streets in lower Manhattan. The lights will be on beginning at sunset on September 11 and will fade away at dawn on September 12. There is no formal program. The lights are best viewed when it is completely dark.